Cuisine Kathleen: Let There Be White!! 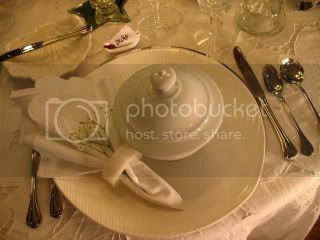 Tablesettings N' More..
Summer.... time to put on your whites! Doesn't feel much like summer here on Long Island in N.Y. We have had lots of rain and not such summery temps. 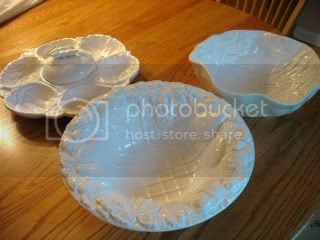 So many of us have the Gibson white dishes..
Gollum got hers at Big Lots at a great price.. I got mine a few years ago at LinensN'Things, with a coupon of course..
As I was thinking about what to use, I came across this pretty white server. It has vegetables on it, can you see? The cover has a pea pod.. Great to keep critters out when serving outdoors..
My dear friend, Anne, gave it to me...May I ask of those who are so inclined to please say a prayer for her? She is fighting for her life...thank you! 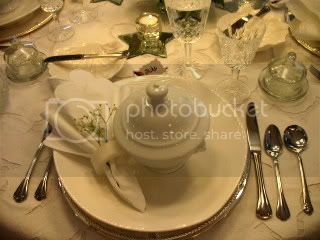 I came across this bowl with vegetables, this cabbage leaf bowl, and my soup tureen..No room to use all those on my table for 4...so another time for them! 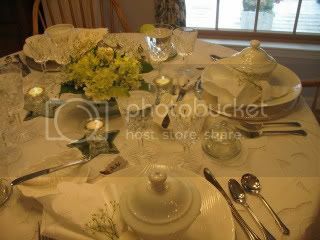 A white to the floor cloth with a cut work over lay.. matching napkins with a sprig of Baby's breath..
Indiv butter dishes....Italian glass votive holders...star mirrors from Pottery Barn outlet. 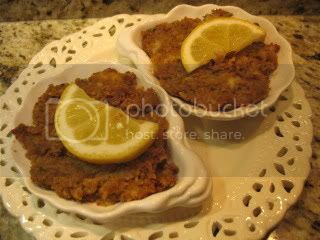 In white porcelain shells.., baked clams.. 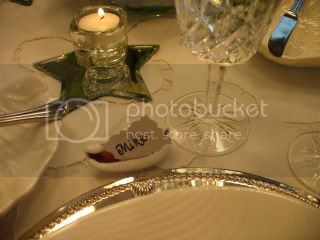 Thank you so much for coming to this little party, please be sure to visit the other blogs..I am sure it will be de "WHITE" ful!! If you are joining the party, please do your post, then copy and paste the link to Mr. Linky! Your white table is simply stunning, and you always make food look like art! Hope you have a great week! I knew you would have a beautiful post! 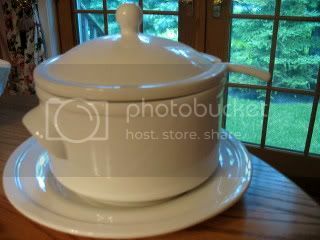 I love the beautiful white server with the vegetable pattern - so pretty - and I envy your covered soup bowls. The cut work overlay tablecloth is gorgeous! Lovely post - top to bottom, Kathleen! 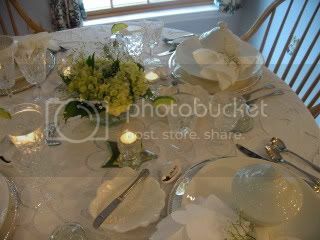 Your Tablescape is lovely! I just simply love love the small bowls with the covered lids! The shell dishes, food is awesome! Your table is beautiful.I am so sorry I missed this event. 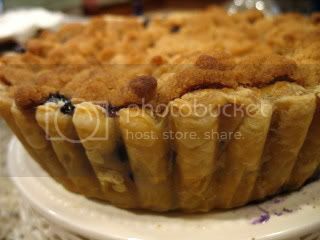 I'm doing blueberries. Happy party, I'll be there next time! You went all out, in typical Kathleen style. I was immediately drawn to the beautiful white tablecloth. And whenever I see a hydrangea, I think of you. So beautiful! We toured a garden recently that had over 30 different hydrangeas. 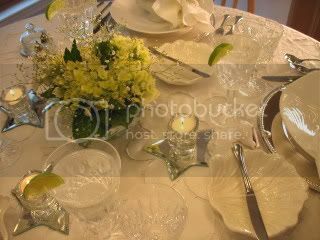 Love your tablesetting, and your meals are always mouth watering! Thanks so much for hosting this fun party. Your friend is in my prayers, Kathleen! You are definitely the hostess with the mostest :) Great whites! Your tables and food always look tops! I will be here tomorrow with my white umbrella and white galoshes, I don't think it's ever going to stop raining! Can I do an all white takeout? I love it, Kathleen! Thanks for hosting this fun event! Kathleen, thank you so much for hosting this white party. These are so much fun. 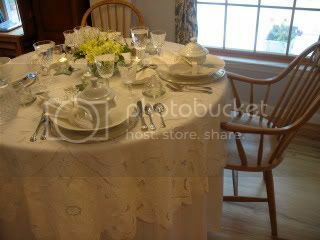 I love your white cutwork lace table cloth. 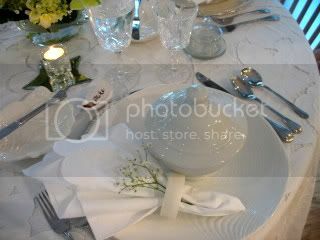 The babys breath in the napkin is just a little touch to make it very special, as well as the beautiful crystal. How beautiful, Kathleen! I love all of your white dishes and the gorgeous tablecloth! Now the food looks so good! Thanks for hosting this fun party! What an elegant table. The candle light brings it to life. My favorites are always the vegetable themed dishes. That is a very unique piece your dear friend gave you. I hope she wins her fight. I think a "white" party is a great idea. I just heard of it tonight so I am late, but I might try to join if you do it again! Your tablescape is beautiful and the food looks scrumptious. I'm going to have to check out you food posts! your layering of white, Kathleen was a beautiful idea...so stunning. 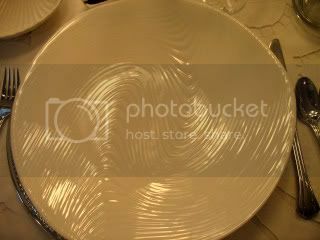 I love your beautiful tablecloth, your dishes, and your soup tureen. Hi Kathleen, Your table looks amazing but I gotta say the food looks even better!! Thanks for hosting this fun event, I hope to be a little more prepared next time! What a great idea -- a white party. But I have a slight quibble with you -- New York clam chowder is RED ... tomato and broth based. New Englanders use the milky stuff (although Rhode Island clam chowder is GREEN, go figure that one out!). 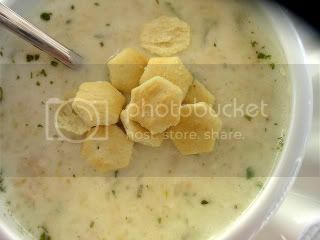 Cass, I didn't say NY clam chowder...LONG ISLAND....and yes, we are close to CT which would be NE! This is so very elegant and tasteful and beautiful! All the little touches make it a very special table. Looks like a pic in a magazine. Oh what a beautiful table!!! 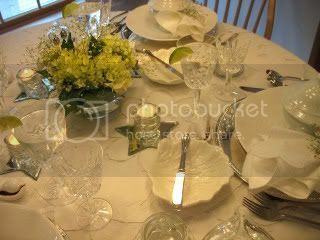 Your family is so lucky - your tablesettings make every thing turn into an event! The setting is gorgeous and I love all your serving pieces.. When can I move in?????? Really love all your white pieces. Table is stunning and food looks fantastic as usual! Thanks for hosting the White" party! Kathleen, what a great party idea. 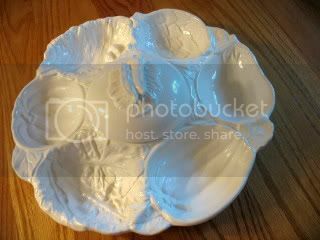 I love your soup bowls, the flowers, the beautiful, calm white pottery. Beautiful tablescape!!! I had planned on playing today, but I decided to take a nap after work yesterday evening instead of putting together a tablescape. Oh well, I'll just have to enjoy looking at everyone else's. Thanks for hosting such a fun party. Drats Kathleen. I didn't comment yesterday, but this looks absolutely lovely. 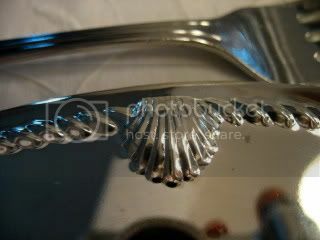 The lion head soup bowls are great, as are the baked clams in the shell dishes. You have pulled it together so well and the food looks tasty as usual. Perfection, 5stars all the way. Kathleen, you always throw the best parties! Lots of pretties as always. Thanks for the wonderful hosting job. Sending good thoughts for your friend Anne. I thought I commented on this yesterday when it was first posted but I guess I just THOUGHT I did :-) Just beautiful Kathleen. I love all your white pieces especially the veggies. So cute. 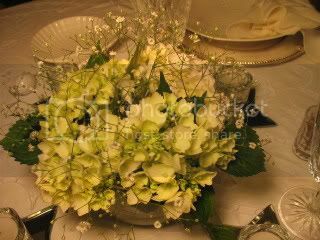 The hint of green in the hydrangea really makes a nice statement. 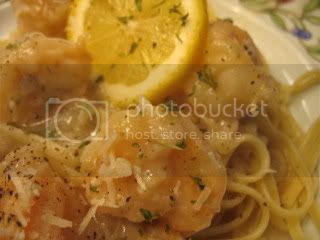 Your shrimp makes my mouth water! This was a fun event even if it wasn't anything I'm too skilled at. Kathleen, I had to pop in again to thank you for hosting! It was a great party! Sending good thoughts for your friend Anne.